Copyright 2012 Emerald Group Publishing. Purpose: The economic impact of ill-health in employed individuals is largely experienced via absenteeism-related and presenteeism-related productivity loss. 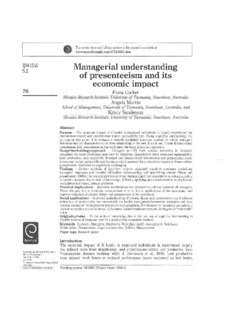 Using cognitive interviewing, the purpose of this paper is to evaluate a recently published interview method by which managers determine key job characteristics and their relationship to the cost of acute and chronic illness-related absenteeism and presenteeism in the workplace: the team production approach. Design/methodology/approach: Managers (n = 20) from various industries in Australia completed the team production interview by telephone. Quantitative items measured replaceability, team production, time sensitivity of output and illness-related absenteeism and presenteeism costs. Concurrent verbal probes followed five items which assessed the productivity impact of illness-related presenteeism, identified as cognitively challenging. Findings: Content analysis of interview outputs examined cognitive processes underlying managers’ responses and revealed difficulties understanding and quantifying chronic illness and presenteeism. Difficulties were categorised as misunderstanding of key concepts/terminology, inability to provide answers due to lack of knowledge, difficulty applying questions/scenarios to employees/workplaces and miscellaneous problems. Practical implications: Interview modifications are proposed to address concerns of managers. These changes aim to minimise measurement error in future applications of the instrument and improve valuation of chronic illness and presenteeism in the workforce. Social implications: Improved understanding of chronic illness and presenteeism could enhance estimation of productivity loss recoverable via health management/promotion strategies and may increase managers’ willingness to implement such programs. Development of valuation methods in a manner acceptable to and informed by business leaders/employers ensures findings have "real-world" value. Originality/value: To the authors’ knowledge, this is the first use of cognitive interviewing to identify sources of response error in a productivity evaluation method.